Big Ben will chime for the first time since August on 9 November, in preparation for Armistice Day. The peals have been stopped for repairs to the Elizabeth Tower. 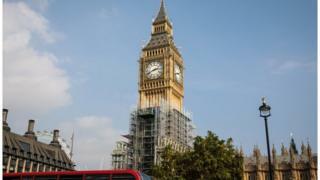 But the chimes may not keep perfect time, parliamentary authorities warned. After marking 09:00 GMT on 9 November, crews will work to remove "slight inaccuracies" to ensure the bell chimes at exactly 11:00 GMT on 11 November. It will fall silent again after marking 13:00 GMT on Remembrance Sunday. They will remain silent until starting again for the Christmas period. When the chimes were stopped in August, authorities emphasised that they would still ring for important occasions. The decision to silence the bell was made in order to protect the hearing of those carrying out repair works on the tower. Precautions have been taken to ensure that workers remain on lower - and quieter - levels of the tower while the bell is ringing. The works are being halted over Christmas, allowing the bell to chime without risk. In August the news that Big Ben would not sound again before 2021 prompted criticism from Theresa May and other MPs. The House of Commons said it would look again at the duration of the project and the scope for hearing the bell's bongs more often.